I finally broke down and did it. I bought a new lawnmower to replace the one that doesn't have a grass chute. And the new one doesn't either - it's a mulching mower that isn't supposed to have one. It has four wheel drive and a three-year warranty. You'd love it. Jen and Bob met me at Lowe's - they had a few things to pick up there, too - and helped me pick it out. Bob put it in his van and will bring it over tomorrow afternoon. I can't wait to mow with it. It was under $300 and I had a coupon for 10% off. The old one was throwing stones and sticks up in my face, so it had become a safety issue. My tummy is better today but my anxiety level isn't. And so I had a thought. 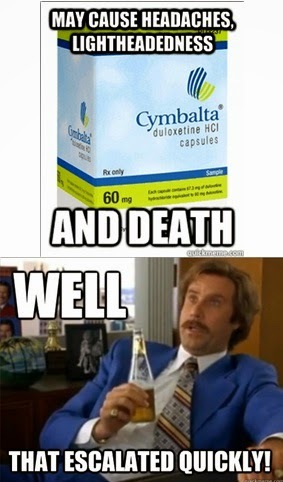 I Googled "Cymbalta withdrawal" again and found anxiety high on the list of symptoms. I think this is the latest layer of Cymbalta withdrawal. I've handled all the rest of the symptoms - the inching and vomiting and insomnia and brain jolts and depression. But this one I can't tough out. I'm only marginally functional right now. So I'm going to try to get in to see Joe on my next day off, and I'm going to ask for help with this. I know it's what you want me to do, and you're right, as always. I still feel like I should apologize for not being able to do this on my own. But I know that I can't, especially when I'm starting a new job. I probably could if you were here and I could stay home. But you're not and I can't. I have to be able to take care of myself by myself. So this is what I have to do. Please keep praying for me, especially between now and whenever I can get in to see Joe. I hope to be able to go to church tomorrow, but am making no promises. I'm being as gentle with myself as I can be, while earning a living. I hope to have better news for you by this time next week. Thank you for listening and caring, and most of all for praying for me.